to pursue my dream of opening a place that would have a positive impact on the lives of shelter cats. Dealing with the city of Atlanta to obtain the permits I needed for this concept was strenuous, but I was finally able to open the doors to Java Cats on March 27, 2016. 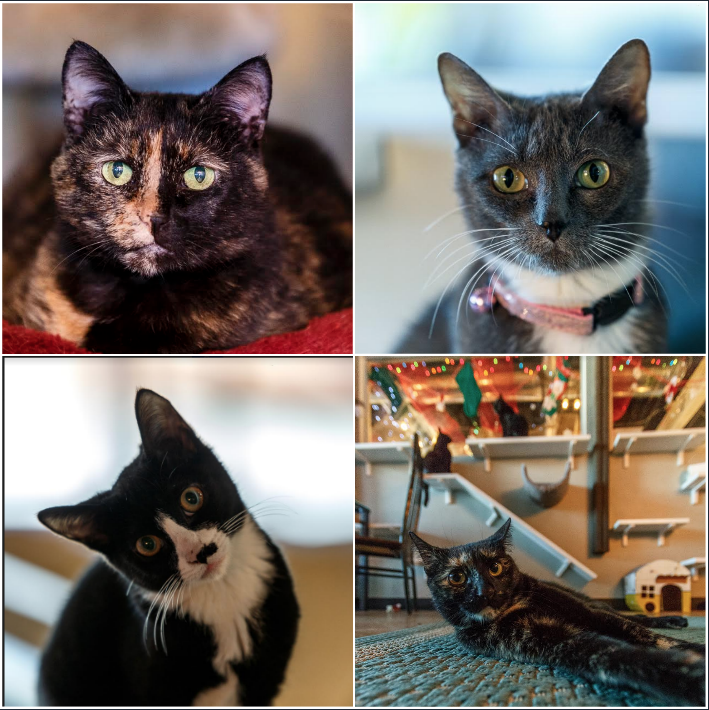 Within the last ten months, we have celebrated 210 adoptions from the Java Cats lounge. more than doubling the yearly rate of our partner shelter. 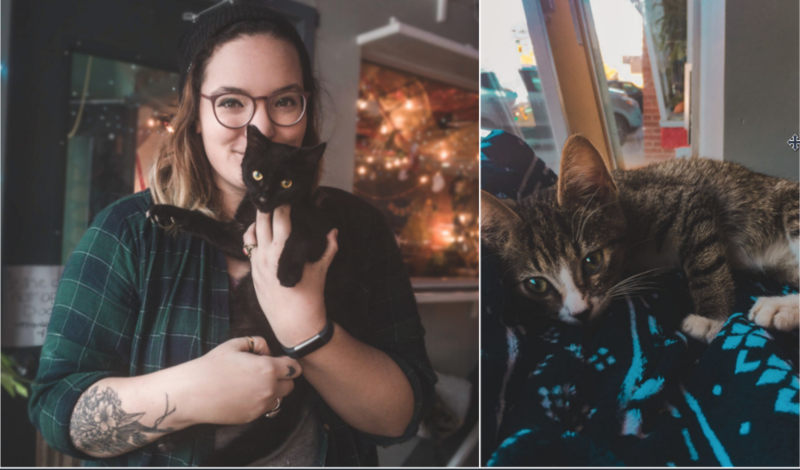 We have been told many times that Java Cats has been a gamechanger for shelter cats and I am so overjoyed that having our cats in a café setting has significantly increased their socialization and their chances of getting adopted. So many shelter cats get overlooked and some go years without being adopted; at Java Cats, those exact cats that have spent years only knowing the shelter life have been adopted in a matter of weeks. 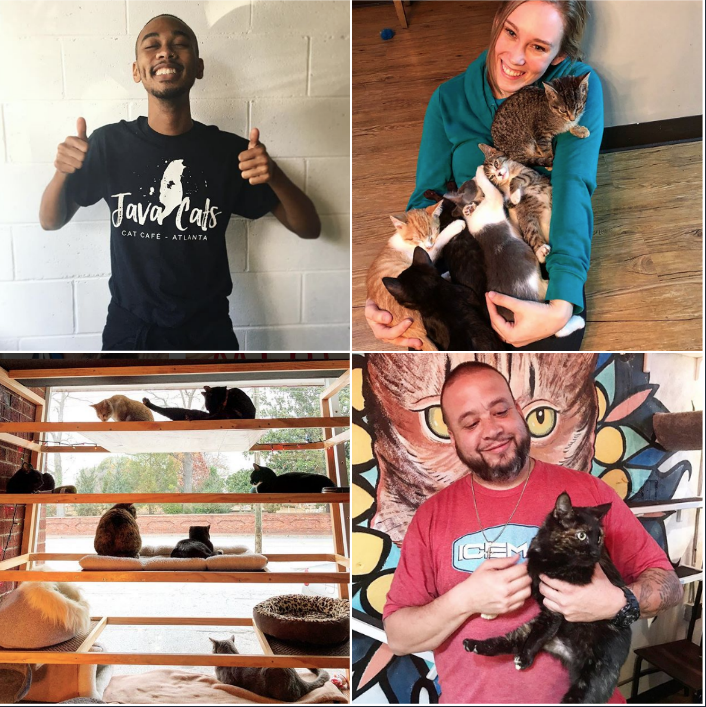 The Java Cats lounge has proven time and time again to have a positive impact on cats that need love and affection to help them heal after being neglected or abandoned in the past. The type of attention and love our cats receive has changed the course of their lives and opens the opportunity for them to find their own families. Our cage-free, customized vertical space designed and built specially for the cats allows them to roam freely. 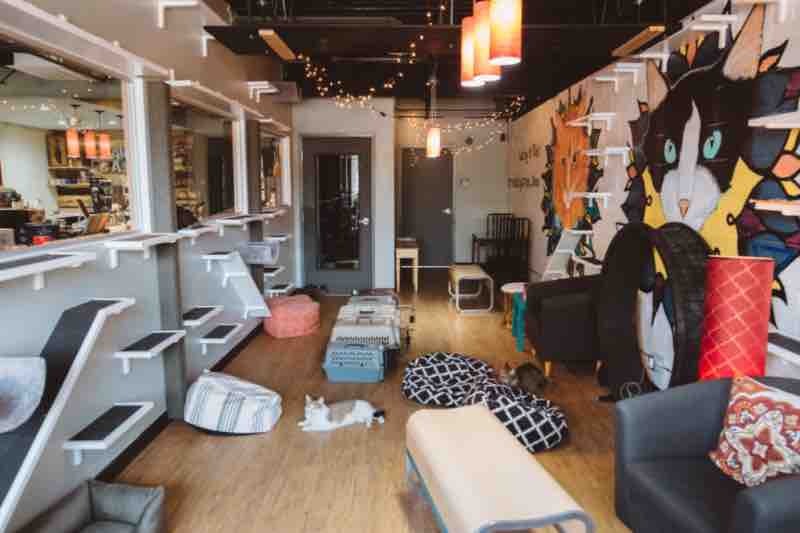 This type of layout provides a safe space for the cats to feel comfortable and for people to get to know the cats for their unique personalities, which in turn allows for more successful adoptions and fewer returns. 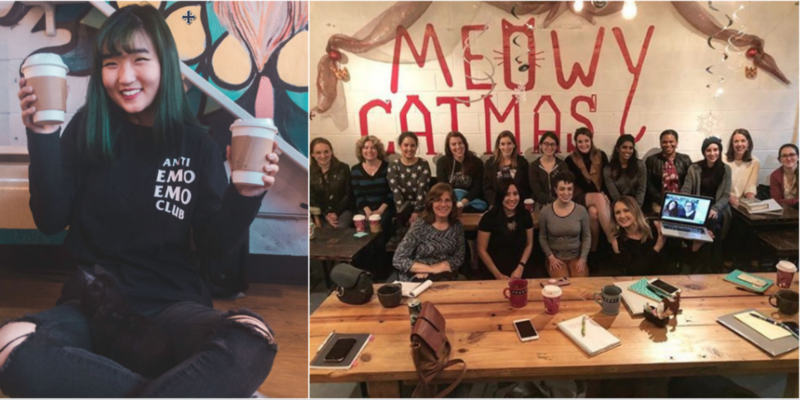 All in all, Java Cats is a pretty amazing place for cats and people! Every shelter has the same problem: for every cat that is adopted, another one is brought into its place immediately. The overpopulation of shelter cats is a nationwide problem I am so passionate about solving, which is why a second location is not only necessary but also so critical when it comes to making even the slightest difference in increasing cat adoptions and making more room for cats so they may avoid euthanasia. 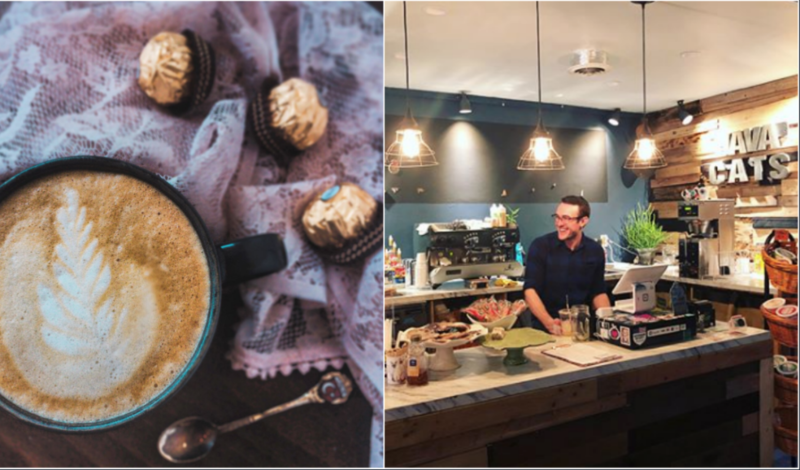 About four months ago, an opportunity arose to open a second location. 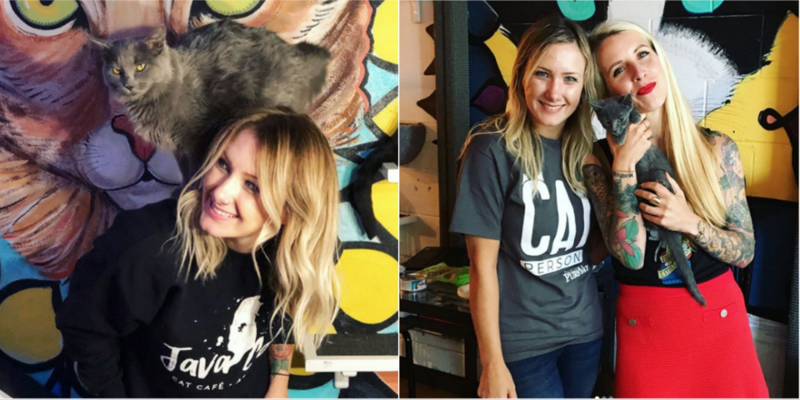 I did not anticipate opening a second location so soon, but after I started to dream a little, I began to think about the impact we could have on even more shelter cats. I decided I would see the space that was being offered and after seeing the building, there was no way I could turn down the opportunity to grow. Our new location more than doubles our current size, meaning that we will be able to house at least 30+ cats and still allow space for a decent size coffee shop! I am hoping to have the new location up and running by May of 2018. To help us get off to a great start, I am hoping to raise funds to aid in the initial expenses. Your contribution will go towards the massive cat lounge we will be furnishing, vertical space, cat related necesities, and my deposit for the building! Opening a business is an expensive venture and unfortunately comes with surprises that (I learned the first time around) you just can't always financially plan for. Any and all help is welcomed, even if it's just a share on social media! Thank you for believing in Java Cats, and I can not wait to see you all in Marietta soon! For those who are questioning : ) ....Java Cats is a highly regulated establishment with regulations that strictly prevent any cross contaminiation of animals and food. The cats are only allowed in a space that is partitioned from the café side. Food is not to be made on site. 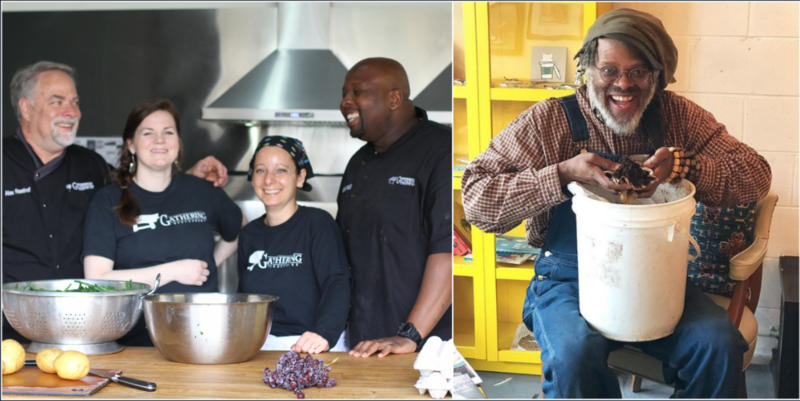 We work with The Gathering Industries, which is a nonprofit that helps the Atlanta homeless learn culinary arts; all snacks, cookies, scones, and other food items. Java Cats also supports local organic farming by donating all coffee and food waste to help underpriveldged communities make compost to grow their own produce. If you would like to hear more of the original Java Cats story, check out the Community Cats interview! UPDATED SOFT OPENING INFORMATION: If you contributed to the gofundme, got your hands dirty on our Marietta work days, or donated furniture/supplies- this invite is for YOU to say THANK YOU for making Meowietta come to life! We will open 5pm-9pm THURSDAY July 5th for a soft opening exclusive to those described above. Due to the anticipated number of people we will be expecting in this small time frame, we kindly ask for the rest of our lovely guests to wait for July 6th and beyond for a visit! We really want to personally thank people who financially and physically helped open Java Cats Meowietta and this is the only day we can offer to do that. Thank you in advance and sorry to publicly announce this, but just wanted to make sure those DMing me or emailing see this (since I am unable to respond to either at the moment)! We will check names at the door and we are super excited for you to see the space! Coffee will be available to purchase, cat lounge will be FREE for 15 minute mini sessions, just to accomadate the amount of people we will be expecting. Please be courteous to other guests visiting as well and sorry for the short window of time. Thank you SO very much for your generous contributions to get Java Cats off the ground! We have set an opening date of July 6th- BUT, for our Gofundme donors, we would love to personally thank you by inviting you to a soft opening before the grand opening. if you are not able to make it and we will send you a voucher to redeem for a free lounge visit on us in the future. To accommodate around 300+ people on July 5th (donors and people who helped us with labor) we ask that lounge visits be around 20 minutes! We really want you to have a sneak peak before anyone else, but do not have a system in place for booking since reservations are only July 6th and forward. Very sorry for the inconvenience, but we are so looking forward to see you all July 5th and we will do our best to make it a smooth day!!!!!!! YALL. Thank you. Thank you. Thank you. I am overwhelmed but the amount of generosity and love that has been extended to us as we raise funds to make Marietta happen! Everyone who has donated will receive a invite to the soft opening so please stay tuned on gofundme as I will post updates on here. Again, thank you. I’m at loss for words for your support and giving. Can not wait to see you soon Marietta.